Grant Muir is a saviour to the local tradies of Sorell. He’s up at 4am each day to open the doors to Velvet at 5am, ready to provide the mass of early risers with their first – and much needed – caffeine fix of the day. “The traffic going into the city is so bad that lots of rural residents try to beat the rush and leave for work earlier,” Grant says. Grant has worked in the foodservice industry for the past 20 years. He’s always had a passion for food – his mum is a chef – buthe was frustrated about the inconsistency for good coffee in the suburbs. “Why should I have to go into Hobart to get a decent coffee? I was fascinated why there was so much inconsistency, and finding a solution intrigued me,” Grant says. The solution involved Grant starting White Moe Espresso in Brighton from scratch in 2012, then taking over Velvet in May 2108 in Sorell, strategically out of town to prove that good coffee can be found outside of the city centre. “It’s been so rewarding. Starting from scratch was tough, but now I know 99 per cent of our customers’ names and orders by heart,” he says. 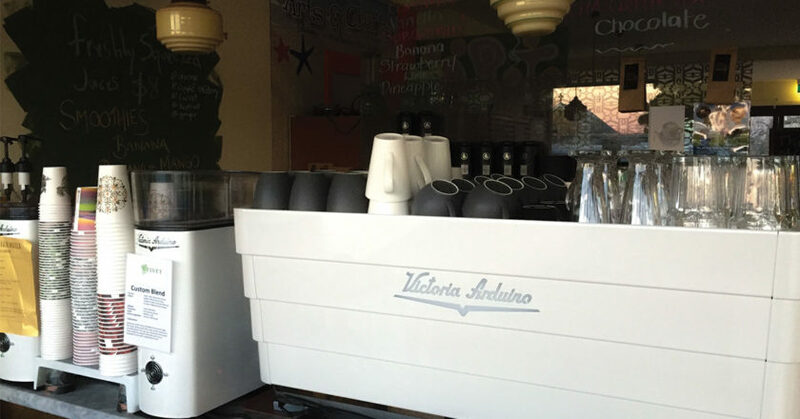 Grant has installed a Victoria Arduino White Eagle three-group espresso machine, two Victoria Arduino White Mythos one grinders, and a Puqpress automated tamper. Grant says the spray-painted white machine and grinders are generally the first thing that jumps out at customers. It means he’s taking his coffee game very seriously. Velvet uses Mocopan Coffee’s custom blend, which he pairs with non-homogenised milk for milk-based orders and single origins from Mocopan or Toby’s Estate for black coffees. His latest was a Guatemalan coffee that “exploded” with real fruit notes and citrus flavours. “I love explaining to people how much more there is to coffee than they think. I’m a people person and talking and helping my customers is what I do best,” Grant says. Velvet’s interior is retro-inspired, with 1960s and 1970s décor that takes guests on a trip down memory lane. “So many customers walk in and comment that they used to have that same chair or table once upon a time. It’s a bit nostalgic,” he says. On the menu, Grant has worked up a very Australian list of café favourites, but what he really prides himself on is the cafe’s friendly approach from staff, who are locals, who then serve locals. “Everybody knows each other and that makes a really fantastic place to come and work each day,” he says.